Of late, the global bone densitometers market has been registering a phenomenal increase in its size and valuation. The significant rise in the pool of patients suffering from arthritis and vitamin D deficiency, supported by the surge in the geriatric population across the world, have influenced this market substantially. The increasing prevalence of osteoporosis in post-menopausal women is also contributing considerably to the growth of this market. Moreover, the growing preference for cost containment measures, advent of portable devices, and the increasing awareness among consumers regarding early diagnosis of diseases are likely to boost the worldwide market for bone densitometers in the years to come. The technological advancements in bone densitometers and the increasing availability and recognition of these devices in emerging economies, such as China, Brazil, Japan, and India, are anticipated to create a promising growth opportunity for market players in the near future. In 2015, the global market for bone densitometers stood at US$0.84 bn. Analysts predict that this market will expand at a CAGR of 3.10% between 2016 and 2024 and touch US$1.11 bn by the end of 2024. Hospitals, specialty clinics, and diagnostic centers are the prime end users of bone densitometers across the world. Contributing more than 60% in the overall revenue generated in this market, hospitals emerged as the key end user of bone densitometers in 2015. Over the forthcoming years, hospitals are anticipated to surface as a prominent hub for bone densitometry diagnostics and devices, globally, which subsequently, will aid the hospitals segment in retaining the leading position. On the other hand, the diagnostic centers segment is likely to witness a high-paced growth over the next few years due to the increasing preference of patients for diagnostic centers, supported by the availability of a number of medical facilities and well-equipped infrastructure in these centers. North America, Asia Pacific, the Middle East and Africa, Latin America, and Europe are the main geographical segments of the worldwide market for bone densitometers. In 2015, North America dominated the global market with a share of nearly 44%. With the introduction of favorable reimbursement policies for the diagnosis of osteoporosis, this regional market is expected to retain its position over the next few years. Europe, which held the second position in the global bone densitometers market, is likely to witness healthy growth in the near future, thanks to the increase in development of newer and sophisticated technologies and the growing awareness among people regarding the benefits of early detection of bone related diseases. Similarly, Asia Pacific is also anticipated to experience a considerable rise in its bone densitometers market in the years to come. Japan has emerged as the leading domestic market for bone densitometers in Asia Pacific, owing to owing to the easy availability of DEXA machines. Developing Asian economies, such as China and India, are projected to offer lucrative growth prospects to players over the next few years, thanks to the improving health care infrastructure, rising private and public investments in life sciences research, and the advancements in diagnostic technologies. GE Healthcare, Hologic Inc., Beammed, Swissray International Inc., Osteosys Co. Ltd., Diagnostic Medical System SA, Medonica Co. Ltd., Osteometer Meditech, Lone Oak Medical Technologies LLC are some of the leading players in the global market for bone densitometers. The bone densitometers market though highly mature in developed countries of the U.S. and Europe, is expected to witness impressive growth in Asia-Pacific and Rest of the World regions due to the rising prevalence of osteoporosis. Consequently, there is an increasing interest in bone density measurement. The market overview section of the report comprises qualitative analysis of the overall bone densitometers market considering the factors determining the market dynamics such as drivers, restraints and opportunities, along with Porter’s five force analysis and market attractiveness analysis. In addition, market opportunity analysis for technology for global as well as Asia Pacific has also been provided. The report also comprises reimbursement scenario in Japan, and China. The global bone densitometers market has been segmented on the basis of technology and end user. The technology segment is further segmented as, axial bone densitometry and peripheral bone densitometry. The axial bone densitometry is further segmented as, dual energy x-ray absorptiometry and quantitative computed tomography. Dual energy x-ray absorptiometry (DEXA) by axial bone densitometry is accounted major share in 2016 of bone densitometers market. Peripheral bone densitometry include single energy X-ray absorptiometry, peripheral dual energy X-ray absorptiometry, radiographic absorptiometry, quantitative ultrasound and peripheral computed tomography. On the basis of end user, the global bone densitometers market is segmented as hospitals, specialty clinics and diagnostics centers. Hospitals remain the major hub in most of the countries across the globe for bone densitometry diagnostics and devices. The diagnostics centers is expected to register high CAGR over forecast period. Increasing patient preference for diagnostics centers owing to availability of more facilities and well equipped infrastructure is expected to boost the growth of segment. Geographically, the bone densitometers market has been classified into five segments namely, North America, Europe, Asia-Pacific, Latin America, and the Middle East & Africa. The market size forecast for each region has been provided for the period 2014 to 2024, in terms of technology and end user, along with the CAGR (%) for the forecast period 2016 to 2024. The market for these technology and end user has been extensively analyzed on the basis of factors such as usage pattern, sales revenue, and geographic presence and product developments. The market size and forecast in terms of revenue (US$ million), for each of these segments, and the sub-segments have been provided for the period 2014 to 2024, considering 2015 as the base year. The report also provides the compounded annual growth rate (CAGR) for each segment for the forecast period 2016 to 2024. 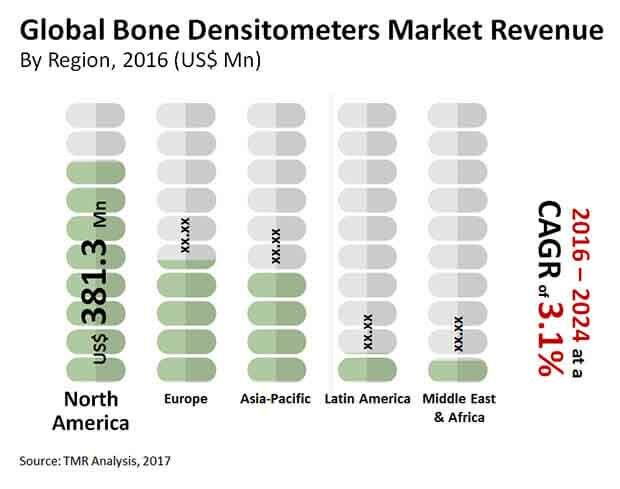 The report also provides a section on the competitive landscape, wherein the market share analysis of leading players in the global bone densitometers market, in terms of percentage share in 2016 (estimated) has been discussed. The report concludes with the profiles of major players in the global bone densitometers market such as GE Healthcare, Hologics, Inc., Osteosys Co. Ltd., Diagnostic medical System SA, Swissray International, Inc., Osteometer Meditech Inc., Beammed, Hitachi, Ltd., Medonica Co. Ltd., and Lone Oak Medical Technologies LLC among others. The major market players are evaluated on various parameters such as company overview, financial overview, product portfolio, business strategies and recent developments.